Wacom is pretty much your only choice when it comes to graphics tablets for your Mac, but luckily its products are always top notch. 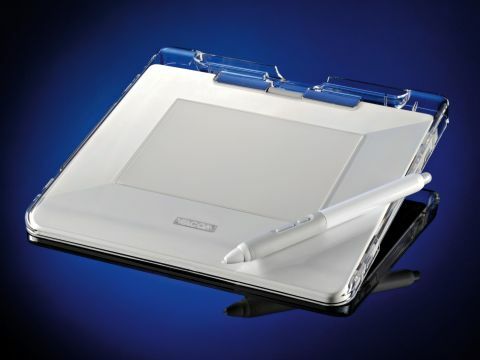 Here it's introduced a new entry-level tablet, the Graphire4. The A6-sized active area is too small for commercial use, in our opinion, so it really is aimed at a first-time tablet user. This makes the Graphire4 a good choice for someone just getting into graphic design, or just trying out a tablet for the first time. The new, white edition is a deliberate nod to Apple, perhaps because most graphic design is done on Macs. Sitting side-by-side, the tablet looks the perfect match to a Mac mini, iMac or MacBook. The tablet will work out of the box with your Mac, but if you want to programme the buttons and pen-scroll, you will need to install the software driver. In testing, there was no interference between the Wacom and the connected mouse, so there's no need to unplug one peripheral when using the other. The pen gives you both the traditional up/ down scrolling ability of a mouse, and you can also zoom in and out of designs and layouts once you've programmed the various buttons. There are two further buttons on the pen, which give you left and right clickability, and, like the buttons on the tablet, take on various extra functions when used with your C and O keys. The mix of programming ability and alternative key settings opens up quite a few options and shortcuts for you. The pen that comes in the box is basic, but gives you varying degrees of sensitivity, which appear in drawings as heavier imprints when more pressure is applied. You can upgrade to other pens, but this one is adequate for beginners and doesn't suffer from a poorer build to achieve this price. Depending on your design software, you can tilt the pen to get a range of airbrush spray effects in some programs. There are a couple of drawbacks to this tablet. Its aspect ratio is not widescreen, whereas all Macs that come with a screen are these days, so it can feel a little awkward. Secondly, a bigger problem is that the active area is quite small.